The Olive House by Eva Sopeoglou in Greece is turning heads with its innovative and sustainable design which mimics the shadows created by olive trees and brings them indoors. The Olive Tree House, a small summer retreat by architect Eva Sopeoglou is located in Halkidiki, Greece. Overlooking olive groves and the sea, the house has been praised for its brilliant simplicity. The home has won three awards for its innovative design including the Popular Choice at New York’s 2017 Architizer A+ Awards, the Best First Project by a Young Architect at the 2017 Domes Awards in Athens, and the 2016 Surface Design Award in the Light and Surface Exterior category in London. The client brief was for a small and low-maintenance weekend home, and one of the key features of the design is sustainability. As such, the project was approached in an ecological way, making the surrounding trees and shrubs part of the composition. It can thus be said that the design was tackled from the outside in. The project’s components were pre-fabricated and can be disassembled at any time, leaving a minimal impact on the surroundings. The wall pattern was inspired by the shade of olive trees and the position of the home is aligned with cardinal points so that it gives this feature maximum impact. As the sun moves throughout the day, the shadows created by the textile-like pattern move and change, mimicking the natural environment. The east creates colorful shadows in the mornings, whilst the southern sunlight around midday creates dramatic light effects in the main area. Interior comfort was achieved by studying the local thermal phenomena and winds, as well as creating natural ventilation via the sloped roof. The 3 x 7m structure includes several rooms connected by a corridor. The lightweight metal fabrication was developed in collaboration with Metalso, and the perforation and folds were made using an industry grade sheet metal CNC punching machine. Building the home included experimenting with cutting-edge digital CAD/CAM technology. Each metal panel is made from galvanized metal and ensuring minimal material wastage. The metal sheets were machine-perforated, hand-folded, and partly CNC-folded to create the 3D texture of the walls. Each panel also has a powder-coated paint finish. 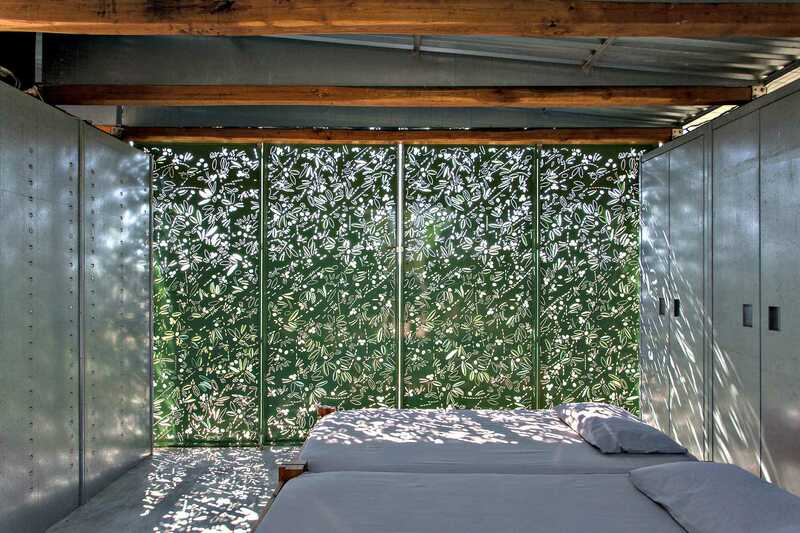 The olive design of the metal structure is an artistic way to bring the outdoors into the rectangular metal structure, thus blurring the separation between outdoors and indoors; olive trees are the theme throughout. This makes the home a paradise within nature, which is also minimalistic. Moreover, the colors and design blend into the natural environment, truly celebrating the olive tree by showcasing its wonders.